After around the first 6 months of life your baby will be ready for start of the next phase of their nutritional development. The current NHS guidelines state that solid food should be introduced at 6 months. This is because at this age your baby’s gut has matured and developmentally they are ready. If your child is having prescribed milk or has intolerances/allergies it is important to seek health visitor advice before commencing introducing solid foods. Baby’s first foods can include mashed or soft cooked fruit and vegetables. You can use a mixture of feeding your baby from a spoon and giving them finger foods to hold and chew. When preparing finger foods a good way to determine the right size is to have a piece big enough to fit into your baby’s fist. It is always best to prepare finger foods length ways into baton sized pieces and cut round foods into quarters (for example, grapes and tomatoes). 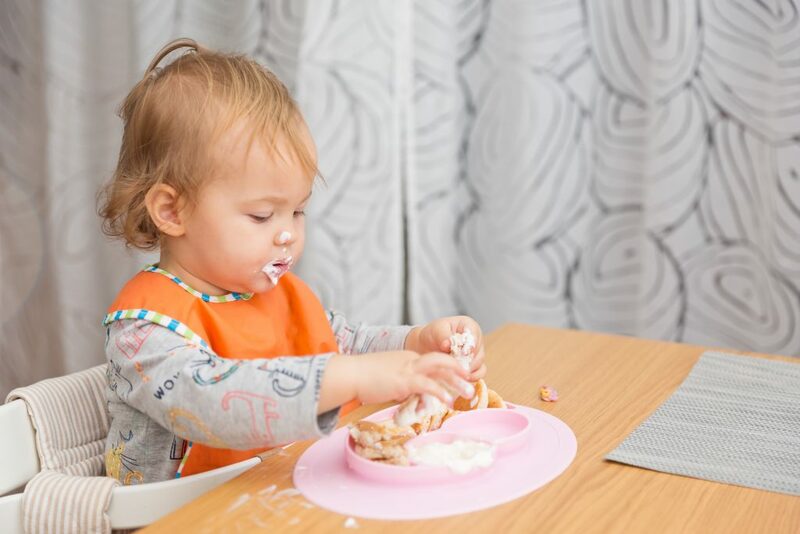 Once your child has got use to eating they can have soft cooked meats, mashed fish, pasta, toast, noodles, well-cooked eggs, full fat dairy products (such as yogurts and cheese). Food can be full of flavour and textures and the more variety your child has the less likely they are to become fussy. Honey should not be given to children under the age of 1. This is because it contains a bacteria they can be harmful.